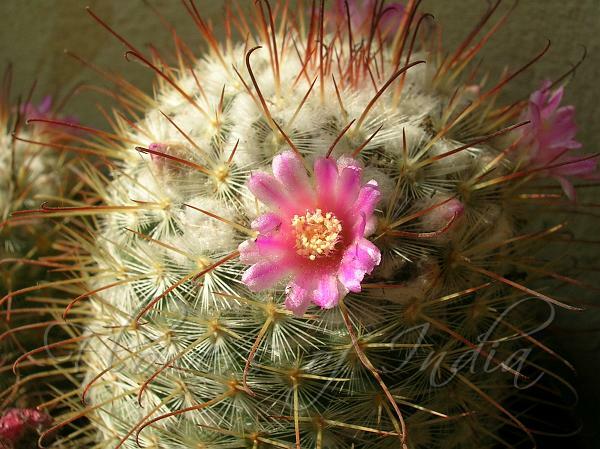 Pincushion cactus is a large group of small, free-flowering cacti that are easy to care for. Most are densely spined, and in many types the spines are so elongated and soft that the plant appears hairy. Stems 1 to several, more or less spherical, dark green, to 2 inches in diameter, covered with spirally arranged projections called "tubercles"; tubercles elliptical, grooved on upper side; areoles at tubercle tips, white-woolly when young; central spines 3-4 or occasionally more, 1/3 inch long, reddish brown, 1 bent downward, others ascending; radial spines 12-20, 1/3� inch long, white with brown tips. Funnel-shaped, 1 inches tall, 1-2 inches across; perianth parts numerous, petal-like, in several rows; outer parts greenish or brownish; inner parts pink to reddish purple; tips sharply pointed; stamens numerous, anthers bright orange. Fruits are berries, fleshy, oblong to club-shaped, green when mature; seeds tiny, pitted, yellowish brown.